Whilst pootling around Gamescom, we happened to stumble across the international launch of Plantronics’ new headset, the serendipitously named GameCom Commander. It looks like something a pilot would stick on their head – that’s because it’s made by the same people who create the high-tech ‘phones used by actual pilots, astronauts and army men – but it also ticks a fair few boxes on our “what we want from new gaming hardware” checklist: supremely over-engineered, tick! Extremely comfortable, tick! Makes you look a bit like a pilot, tick! Ex-NASA technology, tick! 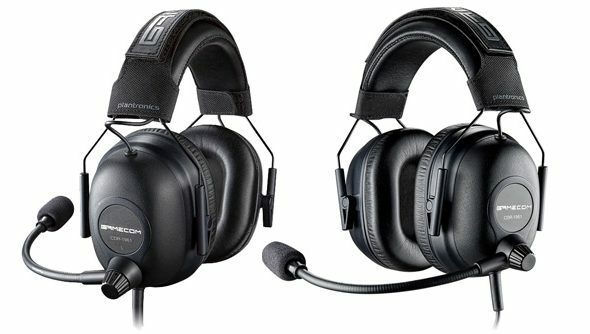 Plantronics’ background is in making headsets for military pilots, so the Commander headset is minimum aviation military spec, while also adding in a load of consumer features that pilots would turn their noses up at (probably a dangerous thing to do while flying a plane). This means it has thenoise isolation a pilot might enjoy, that is to say,good enough to hear another person talking to you inside a helicopter, while also having games-friendly Dolby 7.1 surround sound, breakaway cords for connecting to devices – PC, tablet or mobile – and a rugged design so you can’t smash it to bits without trying really, really hard. 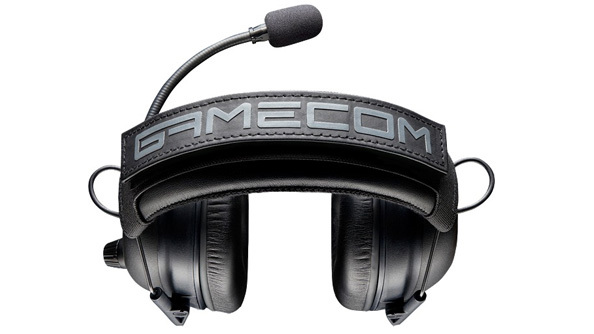 It’s premium hardware though: the GameCom Commandercomes with a €300 price tag, which will scare away many fair-weather fans of sound waves. That said, it doescome with its own carrying case, and a laser-etched, limited edition serial number. Which is sort of amazing.And talking to Corey Rosemond, Plantronics’ business development manager, he’s naturallyconfident that the headset is worth it, considering the high-end quality of thecomponents inside. It’s also worth remembering that even thecheapest headsets used by genuineaviators cost in the region of €700, and that the GameCom Commander is built around that same tech. It’s a pro-gamer bit of kit then, which is likely why it’s been adopted asthe official headset of the Electronic Sports World Cup– and if you’ve ever been in a competitive gaming arena, you know that the noise levels are a bit like a bomb going off next to your ear. Noise isolation becomes a necessity in the face of a constant expo-din. My knackeredold Sennheisers are on their last legs, but I’d personally belikely toconsider plumping for a cheaper set (Plantronics’ lower-spec GameCom 780 is similarly serious-looking, but at a fraction of the price)before scooping out a couple of hundred pounds on these stylish monsters. Your mileage will vary based on precisely how serious you are about sound quality, how loud your neighbours are, how often you compete in cacophonousgaming tournaments and how light your wallet is -and, I guess, how much you want to look like you belong on the set of Top Gun. Tempting.